Anahid who has studied classical dance since childhood and has been active in ballet and modern dance world. How did she come across Oriental dance and started to aspire for professionalism? Finally, the story of Anahid as Oriental dancer begins. 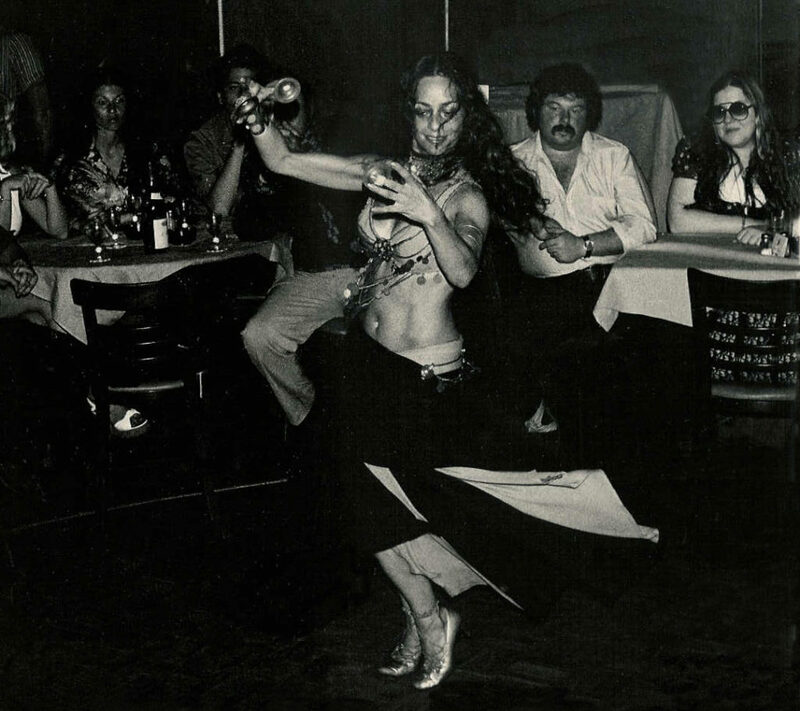 (First Image: Anahid performing at the Persian nightclub “Darvish” in Manhattan, in the Sixties. My discovery of this dance form happened at a time when I was recovering from knee injuries working with a modern dance company in Los Angeles. (Though I was born in NYC, we moved to Los Angeles when I was a child.) It was there that I had all my training in ballet and modern dance. After the injuries, I had to stop all dancing for over a year. It was the Sixties, and I was married to a jazz musician at the time, who wanted to come to NY for his career. During that time I saw my first oriental dancer in NYC! I fell in love with the dance and said to myself, this is therapy for me! No one was teaching at that time, so I learned by watching and then going home to practice, practice, practice! It took me over a year, but I taught myself the dance, and then I decided I wanted to do it professionally, and started to go out working in the clubs, not only the middle eastern clubs, but American clubs, too, who featured bellydancers. There was a lot of work around…. All this time, I kept a day job because I didn’t want to dance in nightclubs six nights week to support myself. But I did work many of the Greek/Persian/Arabic and American clubs, too. So, what started as therapy became a life-long passion. Oriental dance has become established as a dance that can be enjoyed regardless of age even in Japan, because it has less burden on the body. I thought Anahid was very advanced because she had taken it as a therapy early. I would like to introduce you her answers in the next article.